I am a huge fan of 'The Big Bang Theory' and everything about this show amazes me. The concept is brilliant and the cast is perfect. While Sheldon will remain my favorite, my next favorite would be the astrophysicist, Rajesh Koothrappali. The character of Raj is so adorable and Kunal Nayyar pulls it off perfectly. Right from that hairstyle to the sweaters to his body language and accent. When I heard about him writing a book, I had already made up my mind to buy it. Yes, I did want to know how he landed this role and how he is in real life, but most importantly I wanted to know how this geeky lad got a Miss India Universe to marry him. If you didn't know this earlier, he's married to Neha Kapur. The book is not exactly an autobiography. It is a delightfully funny collection of essays. He talks about his early days in India, his parents, his brother and almost everything else that forms his life. The book starts off with a awkward first kiss that he holds on to as a scared commitment. His dream woman is Winnie Cooper from The Wonder Years and he end up actually kissing her later in his life. 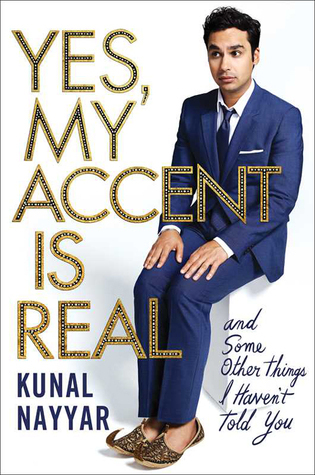 The book traces his journey from New Delhi, to his struggles to become an actor, his "real" job of writing a manual for computer software, his auditions, his love story and everything else in between. Some of these essays are "A thought recorded on a aeroplane cocktail napkin" as he calls it himself and it is hilarious as well as simple to read. The chapter titles are super cool. Made In England, King Of Shuttlecocks, Garbage Man, Chaos Theory etc. When you read the chapter you will know why is called that. His feelings of loneliness and being a outsider is portrayed in a hilarious manner but you can still feel the light hint of melancholy that it is expected to possess. He calls himself the underdog and I do agree with him on that. It is not easy for a confused young man to travel two continents in search of a dream and still emerge as one of the top paid actors in the world. My favorite chapter however was 'And Then I Fell In Love'. This chapter describes in detail how he met Neha and how they ended up getting married. I found their love story to be so cute. His first reaction when he saw her was "Oh my God, she's tall" and she on the other hand had never heard about 'The Big Bang Theory'. He was introduced to her by her cousin and their first meeting was so normal and sweet. I can go back and read it again and again. He ends this chapter brilliantly by saying "You can't find the love of your life without risking breaking you heart". Yes, couldn't agree more. You just have to dive in. The next chapter talks of his big fan Indian wedding that took place over seven days and he's described it perfectly. He was away in America while Neha and his family planned the wedding. Seven days, seven parties and our man had no idea what was happening. Only after Neha told him that they're married, did he realize that they were actually married! His dedication to her in the acknowledgements is one the sweetest things that you'll ever see. This is a really good book for a breezy read. It is funny and sweet in the right places and inspiring in the other places. If you have even just heard of him, give this book a try. Verdict: I loved it. Definitely worth a read. I am huge fan of TBBT too and Sheldon is my absolute favorite. Agree Kunal is simply adorable as Rajesh. I picked up this book to know more about him and his journey. And it was a delightful read. Look how adorably goofy he looks on the cover! You should listen to his podcast with the AIB guys, that was quite something too. "their love story to be so cute" "go back and read it again and again". Sounds interesting. I will certainly read this book. I have gotta read this one. After reading your reviews I am realizing how many good books I have missed reading. On my list now :D Great review. Haven't read this but I do like essays. Who is Neha Kapur?? I gather she is someone famous but I can't be bothered to google. Tìm hiểu nhận đấu giá ebay là gì và dịch vụ order hàng Hàn Quốc giá rẻ uy tín với bảng cước phí giá ship hàng từ Hàn Quốc về Việt Nam và dịch vụ mua hộ hàng Mỹ ship về VN uy tín.